Kitty Rambles A Lot: Plus Equals Win! Recently I was immensely lucky, and I won a £100 Plus Equals voucher via an instagram competition they ran! I was so excited, and I also immediately knew what I was going to spend that voucher on. This magnificent faux leather jacket. 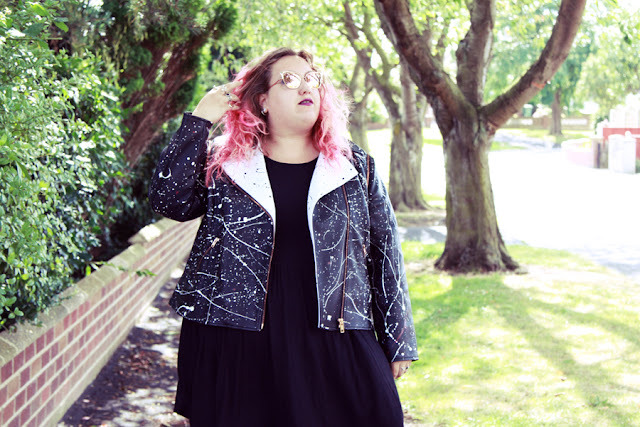 I'd seen it before and fell in love, but just couldn't justify buying a third faux leather jacket, even if it is totally different to the others I own. This jacket retailed for £100, my voucher was for £100, it was meant to be. 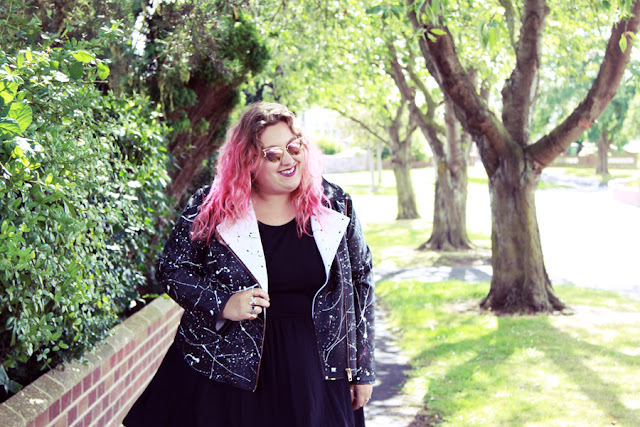 Plus Equals sell up to a size 26 and are a vintage shop that specialises in plus size. I don't think I've ever seen another store offering vintage plus sizes, and especially not such unique upcycled and reclaimed pieces. This jacket features a white panel along the inside of the collar and it fastens over to the left side rather than in the centre. 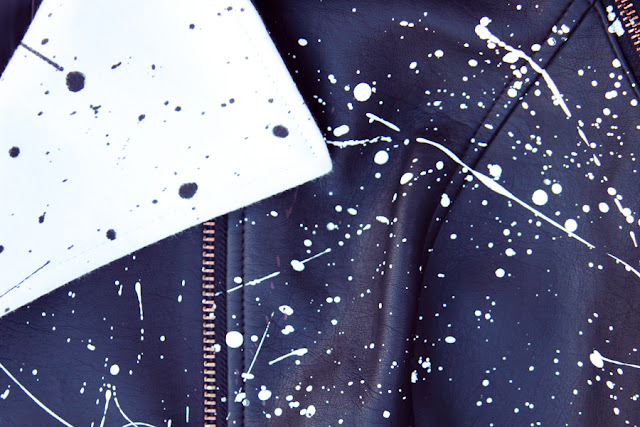 The white sections have black ink splatters, and the rest of the jacket has predominantly white splatters, with some red. It also features rose gold hardware, which is a trend I am really late to get into and am now totally sold on. Probably the coolest thing about this jacket is that the sleeves zip completely off, making it into a waistcoat. 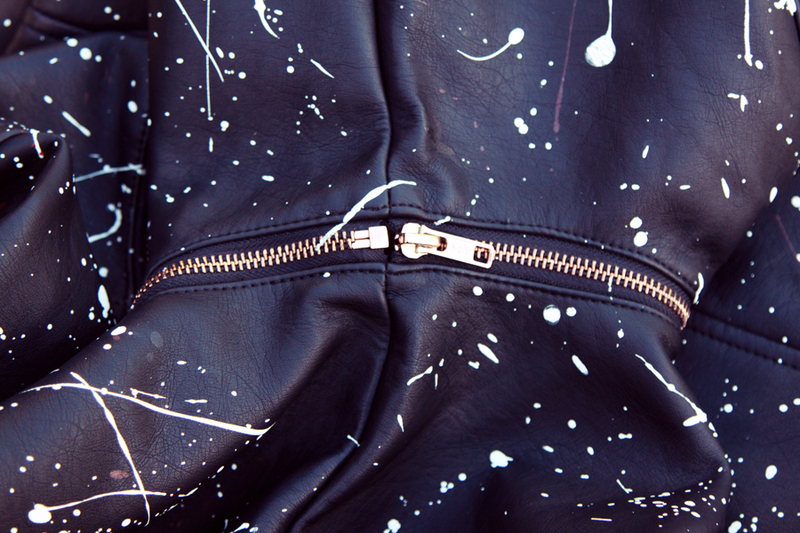 It makes the jacket so much more versatile, perfect for when the days start turning to autumn. I love a sleeveless cover up, I actually just cut the sleeves off a denim jacket I'm modifying because I love the style so much. 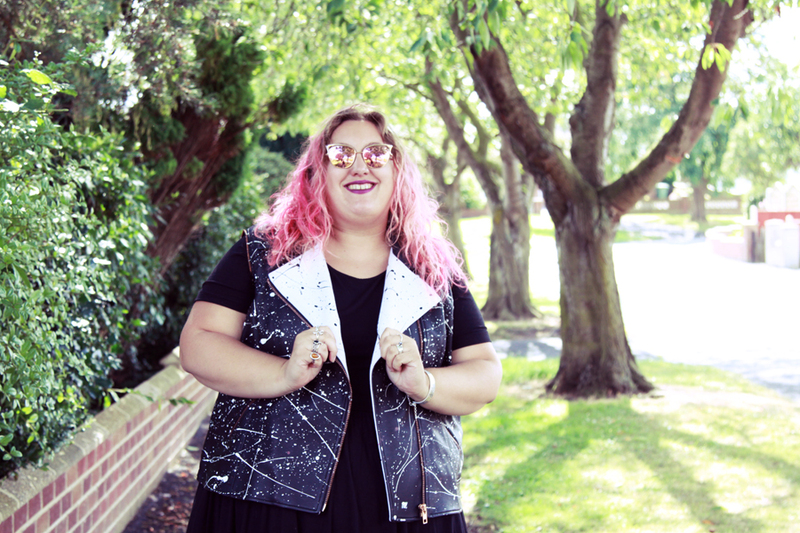 This jacket is all kinds of punk rock cool, and I am so happy I could add it to my wardrobe. Plus Equals have so many unique and unusual pieces, if you want a really stand out piece definitely check them out. All their pieces are one offs, so you know you aren't going to bump into anyone else rocking the same thing! This is absolutely one of the coolest things I own, so thank you Plus Equals! PS. My sunglasses are by Quay Australia and I got them on ASOS. They are sold out, but they tend to release this style in other colours each season. Love it. The splatters really give it a cool twist. I am off to check out plus equals. totally do! Unusual vintage stuff for plus sizes is so rare :) thanks! Congratulations on the win and awesome purchase, love the jacket! Congrats on the win. I love that jacket a lot Kitty. 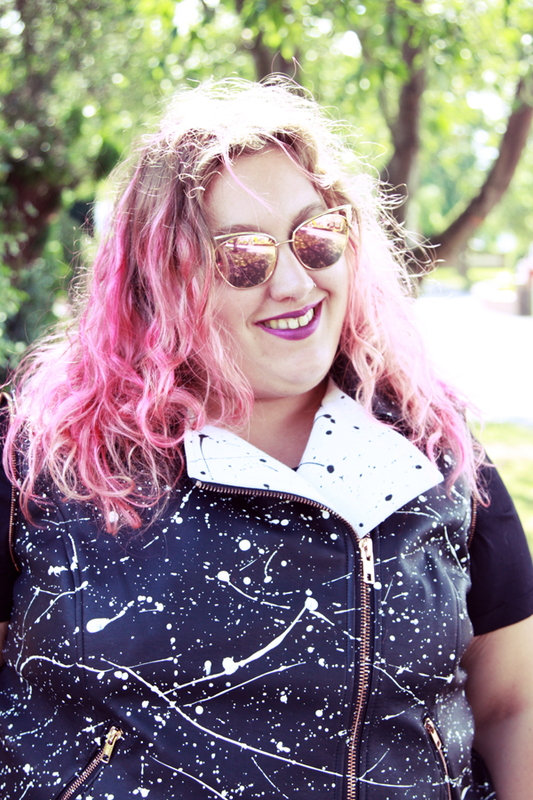 I remember seeing this jacket at CurvyCon and thinking how cool it is! You totally rock it!